Epping was named after the east London/Essex town of the same name. Epping Aquatic Centre sits surrounded by bush in this leafy northern suburb of Sydney. It’s a wonderful place to swim, with those tall gum trees towering over on all sides, and the bush inhabitants squawking or cooing as you plough up and down your laps. I was pleased to get to Epping Pool before we move interstate because this iconic pool was under threat a few years ago, with a campaign to save it even opening their own Twitter feed. Funnily enough, the pool looks as if it has been saved by virtue of another unpopular NSW government policy: the council mergers and re-bordering. You see, as the lady managing the reception desk told me when I arrived on a sultry but showery morning in late November, the pool is now under Parramatta Council, rather than Hornsby, and Parramatta has already lost another of its swimming icons this year (not, she emphasised, anything to do with local decision-making, but rather again a state government edict), with the closure of Parramatta War Memorial Pool. But for today, this was my farewell swim in Sydney, so it was apt that it should be in such beautiful bush surroundings, especially as this sort of area was where I lived when I first got to know Sydney 50 years ago (in those days, Lane Cove was our local pool, but Epping reminds me of Lane Cove, at least poolside). There are great views whichever direction you swim in for backstroke with those trees above you all around. When I first arrived at the pool, I had just driven through a torrential rain shower, and when I arrived at the pool, there were two coach loads of school girls having lessons in the water. But this was my lucky day: the rain cleared up and the girls cleared off, almost as soon as I arrived, so there were just three of us plodding gently up and down for the half hour or so of my swim. It’s a beautiful but unpretentious place, Epping Aquatic Centre. They make no claims to have nurtured former Olympic swimmers, but they have a national standard squad training here, so there may be future Olympians here now. And aside from the plaque marking the date in 1960 when Eastwood-Epping pool first opened, little is made of the place’s history. Either this is just a simple community resource, or they are missing out on potentially interesting stories, here. Anybody got memories of Epping Pool in the 57 years of its existence? Blimey, I just realised, I am actually older than the pool itself. Epping train station is a good 10-15 minute hike from the pool and there are lot of train services on this northern suburbs line loop. Lots of parking by the pool too. There are hoists for disabled access, but otherwise this is a good old-fashioned Olympic Pool, with nothing remarkable about the ways into the water. Lovely old changing rooms – I loved the old signs to toilets and showers in the Gents, and rather liked also the warnings for lightning. When there are so many trees about, it probably makes good sense to be cautious about where lightning might strike round here – see the photo in the gallery…. 1.1m shallow end, 1.8m deep end. Also learners pool and toddlers paddling pool under shade. I didn’t find too many stories about Epping Pool, so I may need to hear from locals who have known it since its opening day in 1960. This is the website set up for the successful campaign to Save Epping Pool! 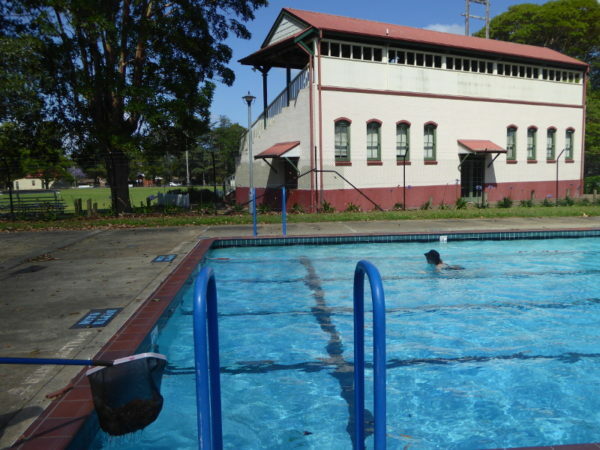 The thing about parents posting about good swim places for kids is that the 50m pool comes last if it gets a mention at all…So scroll down for the mention of Epping in Parra Parents website. But the Sydney Mums Group website does have a Mum who went to the Olympic Pool at Epping. Alpha Espresso reviewed by the FancyaCuppa website. Pablo & Rusty’s coffee is always likely to do you a good flat white and indeed the coffee at Alpha in Epping was as smooth and tasty as I had hoped. Nice pastries too, and an overall good community feel to this coffee shop on the poolside of the tracks in Epping. I learned to swim here in 1968-69 as a 7 year old child though at that time it was called Dence (or Dense?) Park .I have no idea where that name came from. One of my fondest memories was just floating in the ‘big pool’ and looking up at the gum trees that surrounded the pool, occasionally lifting an ear out to hear the din of the summer cicadas. I’m glad the trees are still there and the community has saved the pool. I think there were 3 pools at the time- a baby pool, a in between pool and the Olympic sized ‘big pool’. The building looks pretty much the same, except painted. From the pool area you couldn’t see any houses. Just last February I completed my self challenge to swim in every Ocean and Sea around Australia. Perhaps that could be your next challenge? We must be about the same age, Margot, though sadly I couldn’t swim when I lived near here in 1967-68. Yes it really felt like a pool that had changed little in many years, and you’ll be pleased to know there are still no houses to be seen from the pool! Love the idea of your challenge – are you writing about it anywhere? No houses in view- that’s wonderful. I thought civilization ( or the Suburbs) would have encroached by now! The name of the park comes from John Dence who owned seven acres from 1902. When sub-divided in 1958, council bought part of the land for the park and pool. I seem to recall reading somewhere that the construction of the pool, however, was actually funded by public subscription. Many of my early childhood hot summers days were often spent here at what we then called “Dence park pool”. I had swimming lessons there too. I lived in North Ryde and we caught the bus along Epping highway. The walk up from the highway was very tiring I remember. Getting to the downhill entrance of the pool was a relief. I remember having school swimming lessons at dence park. I have a recollection of there being a lions mouth at the top of the railing and we would put a coin in it and hear it rattle down. Also remember great honeycomb, God, does that stuff still exist? Hi Margot, I think we went to school together although I now reside on Queenslands sunshine coast. Ps, carlingford high school. Hi Alison, yes I was at Carlingford High, and I think you must have had a different surname. Gosh that was so long ago. I seem to remember the lions head too, with it’s rattling coin drop. We didn’t get the honeycomb but I remember occasionally getting a ‘Sunnyboy’ ice block, one of those weird triangular shaped, cardboard covered frozen orange cordial/juice blocks. What a treat on a hot day! I live on the NSW South Coast and still love to just float……. I remember the “honeycomb” well, wrapped in cellophane and a bit like the inside of a Violet Crumble though a bit chewier, and also the trampolines in a fenced-off area just past the deep end which you had to pay to play on for maybe 10 minutes or so per pay, though they weren’t always open – I guess there had to be someone there to watch them and collect the money. Apart from swimming or playing in the water, as kids we spent quite a lot of time scavenging for bottles to return to the kiosk to collect the refund to pay for honeycomb or trampoline time.